Lady Satan is a freelance agent. By freelance I mean she is not officially associated with any organization as none are ever mentioned. Still, in her second adventure, she is given a secret message with orders so she had to working with someone else - who, we never know. We do know from the beginning, though, that she is "a strange, mysterious woman [who] dedicates her life to ferret out the secrets of the enemies of democracy and to turn these secrets over to the nations engaged in a death struggle to keep the light of liberty aglow. This weird, swift striking character is known as .... Lady .. Satan." At the start of WWII, the woman who would become Lady Satan is on a cruise ship heading from Europe to New York along with her fiancée. According to a statement by him, the couple were to be married when they reached America. The fact that the nuptials were to take place in the States is the main reason I postulate that they were Americans. That wedding was never to be, though, as Nazi bombers attacked the ship and he was killed. Floating amongst the debris, a very angry woman vows, "I swear henceforth to devote my life to their destruction. My enemies will feel the wrath of Lady Satan." What her name was before she took that oath and changed her moniker is never revealed. She somehow managed to return to the mainland and began her personal crusade against the tyranny that ordered the destruction of the ship, costing her the life of her love. Regarding names, though, in the first mission we find her on, a German officer she is trying to woo addresses her formally as "Madame Satan" which would indicate she took the last name of Satan instead of just using it as a covername. Lady Satan does her best work in a slinky red evening dress, complete with a red mask covering her eyes. With her deep black hair, it makes for a very alluring sight, all the better to lure in and destroy her enemies. She is also seen adding a cape with a cowl over the dress which does add a nice amount of flair to her actions. Quite athletic and fearless when it comes to dangerous stunts, she is adept at hand-to-hand combat and if her fighting skills are not enough, she does have a special gun that can discharge chlorine gas to help her escape. There are only two recorded adventures of Lady Satan but considering how some ordinary soldiers seem to know who she is and express relief that she had survived a harrowing mission, she apparently has been busy. Now, jump ahead four years, many months after the end of WWII. Lady Satan is a fighter of evil. She is a beautiful woman who favors red evening dresses, a (red or black) eye mask, and often a red cape with a cowl, lives for the chance to fight evil ghosts and phantoms and vampires and werewolves and anything else that goes bump in the night. She mentions in her first recorded adventure (in this persona) that she might be "the only person in the world today who is a master of the art of Black Magic" which is why she is called Lady Satan. Exactly where she lives is not known but it is obviously in the States and she is by no means unknown in the region. According to the police in one story, Lady Satan's address and phone number were closely guarded secrets but the desk sergeant knows how to contact her. In the next adventure, a lady needing help calls the local newspaper asking them to contact Lady Satan for help and she responds immediately. Besides her athleticism and her keen investigative skills, Lady Satan has several extra tricks to help her in her line of work. One is "Xanda Powder" which can apparently do miracles - it certainly can change werewolves back to human form. There there is the urn containing something given her by a Tibetan lama which can summon the Shadow People who can ferret out bad guys. Finally, she mentions once that she has the strength of 20 men which comes in handy for pulling chains attached to walls. Is there one Lady Satan who, when the fight against the tyrants came to an end, chose a different enemy to fight? Is there a second Lady Satan with her own unspoken origin who has some nifty skills and tools to use in her crusade against a different kind of evil? I do not know. They look the same. They dress the same. They act the same. Strong evidence pointing to the former but no definitive proof. And then comes the early 70's! The year 1974 brings us Anne Jason, a beautiful 23-year old black woman just graduated from Vassar and ready to take on the world. What she gets, though, is a change no one expected, one that will give her the title of Lady Satan and an excursion into the realm of the underworld and a meeting with the Devil himself. Ms Jason gets mention here not because there is any possibility she is at all connected with the person(s) above but because she will use, or have used for her, that same name and when reading about Lady Satan, it is good to know which one is being mentioned. This Lady Satan is not the other. And on to the 2010's. 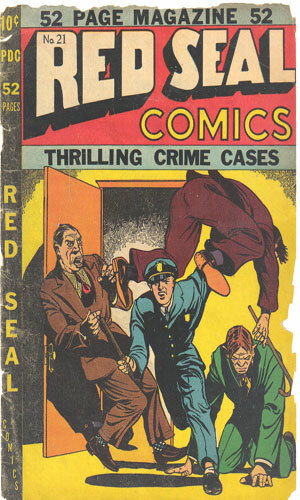 Bit of a leap but a Lady Satan from the 30's, dressed in a sleek red dress with a red cape and a cowl, wearing a eye-mask, is joining a group of other vigilantes and taking on a particularly nasty lady who is time-hopping and the group after her have to do the same. This Lady Satan is a glib, alluring, and playful woman who happens to have horns on her head. Real one? Unknown. 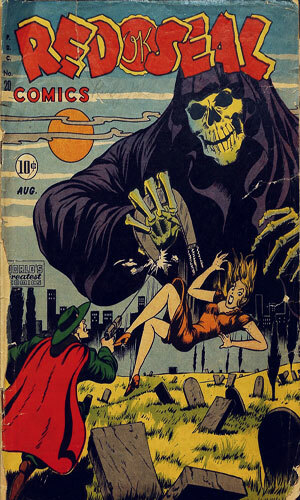 Note: If the above is not confusing enough, it is important to remember that the Lady Satan(s) we are discussing here is in no way connected with Madam Satan, a very evil character who had her own short run of adventures in the pages of Pep Comics in 1941, starting with #16 and going until #21. From Dynamic Comics #2 - Tells in 3 panels the reason she is at war with the Nazis. In this mission, she is after plans for a submarine detector. 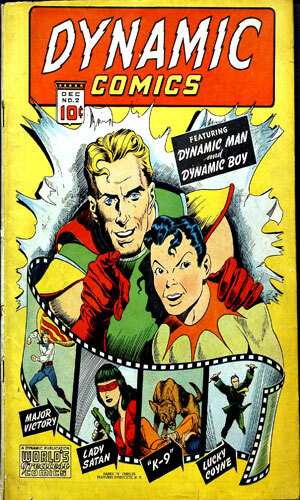 From Dynamic Comics #3 - Lady Satan uncovers a plan by the German High Command to send an impostor to a mid-Atlantic meeting between Churchill and Roosevelt and there to kill them both. She flies (literally) to save the day. From Red Seal Comics #17 - Driving home one night, Lady Satan sees three youngsters along the side of a country road. She stops to help and they turn into werewolves under the control of an evil master/kidnapper wanting to build an army. From Red Seal Comics #18 - A dear and old friend asks Lady Satan for help at a remote mansion where her father disappeared and two spooky servants do not like visitors. From Red Seal Comics #20 - An adult brother and sister appeal to the police to ask Lady Satan for help to find out who is haunting their house and why. From Red Seal Comics #21 - When a tree becomes animated, attacks a young girl and kills her dog, the mom contacts Lady Satan for help. The four were bundled in one issue by Nuelow Games in December 2015 under the title shown above. A eight-part mini-series from 2015-2016 in which a creature known as the Red Death is able to move through time causing a lot of chaos as she tries to destroy all life. 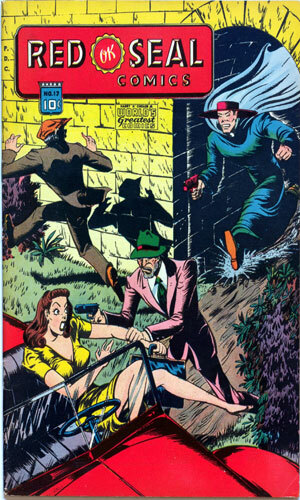 Going up against her are heroes from the 30s and modern time including the Shadow, Green Hornet and Kato, and others. One of the minor characters taking part is a sultry and saucy Lady Satan, complete with red dress, red cape with cowl, and ?horns?. 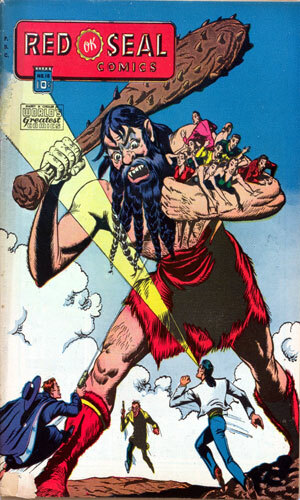 The stories were combined into one trade paperback. The game mentioned below is definitely NOT about the Lady Satan who was a freelance agent during WWII and became a masked vigilante after the War. This is set in modern times and is about the Devil causing lots of unpleasant trouble. Still, with the name Lady Satan, if I did not mention it here, someone might wonder. 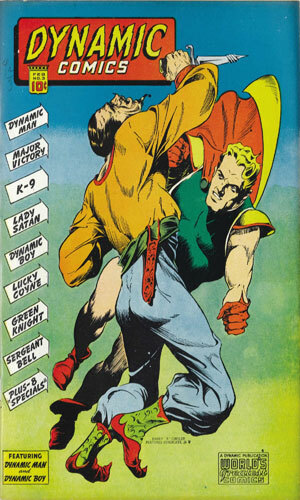 A role-playing game, rules written by Steve Miller, based on a comic story in Psycho #8, released in September 1972. 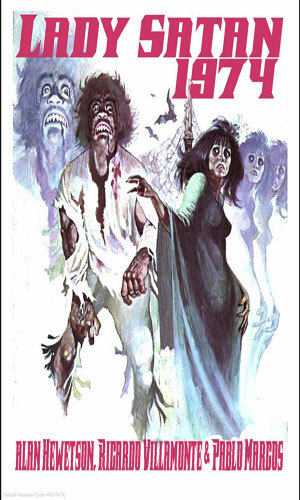 The story was entitled Devil's Woman and was written by Marv Wolfman and drawn by Ross Andru and Mike Esposito. The story deals with a child of Satan who would rather not be. The game lets people play with being children of the Devil and dealing with it. Wow! For a woman who had only two adventures as a spy and maybe a few more as a vigilante, this lady is very interesting indeed. The stories with her as an operative are standard fare for that time period although she having the ability to do the leaping and flying and parachuting and shooting and so on was impressive. And the chlorine gas gun was interesting. When she became a vigilante going after bumps in the night, the stories are equally "standard" in their feel but I enjoyed them despite her being a woman of mystery that everyone knows. The 70's iteration of course is not her so they do not need comment beyond that. The return of Lady Satan in Masks 2 is interesting in their own right because I cannot figure out why she is along with the others. 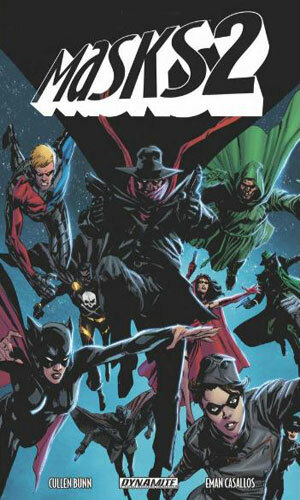 Still, she is and that makes the stories even more fun than they already were with the Shadow and the Green Hornet sharing the stage.